I first came across Crafty Foxx when someone I follow on Twitter retweeted one of their tweets, which had an image of one of their beautiful designs and I instantly had to take a look at their profile. I loved what I saw and promptly followed Lian, who is the artist behind family-run art design business Crafty Foxx. I genuinely love Lian’s designs and engaged with some of her tweets and then she asked if I’d like to review one of her prints. Of course I jumped at the chance! But I didn’t just want to do a review, I wanted to find out more about Lian and her passion for her business. So I got to know her a bit better. What did you do prior to setting up this business? I’ve always been interested in arts and crafts and making things for myself or our house. I love interior design and recently completed an upholstery course so I could breathe some life into a lovely old armchair. Back in my twenties I made jewellery and sold it to gift shops and had my pieces in quite a few galleries, which was a great achievement. Working in London, HR predominantly within the finance industry, and bringing up a family took over sadly. After leaving London and moving to Wiltshire in 2011, I started feeding my creative side again with this way of producing art (having seen something similar, albeit basic, when I was in London) mainly with children’s names and it escalated from there. Cutting into mount board or doing this type of art isn’t new, there are quite a lot of companies doing this now, however our designs are very unique and detailed. On the whole I think we have Henri Matisse to thank for cutting into paper and mountboard way back in the 1930s – it’s been around for a very long time. 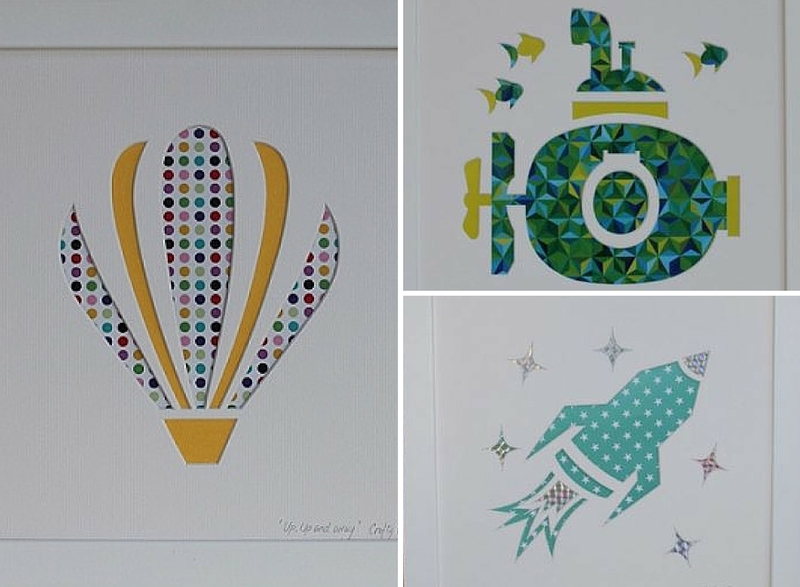 ‘Up, up and away’ Hot Air Balloon, Snazzy Submarine and Rocket Blast designs from Crafty Foxx. A manic school run, followed by copious amounts of coffee! Every day is different – I’ll either be working on new designs, working with new patterns, sourcing fabrics and making up orders. I’m constantly looking for what’s going on in the fashion industry as you can get an idea of new trends, colours, patterns and what works. I’m constantly updating our website, working with British manufacturers to keep costs down, sourcing material and constantly doodling and looking for the next trend! I don’t come up for air until it’s school pick up, then I’m back to being a mum again. Then in the evening I’ll catch up on emails, new accounts, ordering materials etc. Then I start the whole process again the next day! I have a great marketing team behind me that support me on social media and they also help with putting me in touch with the right contacts too. I’m blessed to have a good network around me. We start with a hand drawn design, which we convert into a digital silhouette image. We then cut these images into artist grade mount board, combine it with a gorgeous background from our extensive range and assemble it all in a wooden frame to produce beautiful, eye-catching pieces of art. Most of our designs come from feedback and requests, which is great. We have about another 15 designs to add to our portfolio in the next few weeks as well as breathing some new life into our older designs to make them more current. 2016 is around the corner, where do you plan on taking the brand? To continue expanding overseas, extend the range of designs and therefore appeal to a wider audience and continue to sell to shops where we have received some encouraging feedback. I have a lot of new ideas, bigger, bolder, brighter and unique designs. I’m constantly looking to push the boundaries with cutting the detail into mount board – it’s a hard material to work with believe it or not! Additionally, we’ll extend the fabrics and background pattern range. Being very creative, I never switch off and ideas are always bubbling away… I just need to rein myself in at times and try not to run too fast! What advice would you give to others looking to set up a business? Do it! Research as much as possible, develop constantly as there will always be competition hot on your heels. Be prepared to work twice as hard as you have ever done in your life – tough but rewarding. Read my review of ‘Giraffe Mother &Baby’ by Crafty Foxx designs.